The Dodge Viper is one of the last truly intimidating cars, with a ludicrously powerful V10 up front and no mercy given to the nut behind the wheel. Running it on a nice, safe track with ample runoff is crazy enough, but the Aussies at Whitehot Motorsport made their Viper into a rally car and took it on the Targa Tasmania. The Targa Tasmania is one of the most intense tarmac rallies in the world, lasting for six days on the Australian island of—you guessed it—Tasmania. It’s six days long, and drivers only get one shot to blast down each stage road. All kinds of cool stuff enters, from classics and supercars to traditional stage rally cars, to—you guessed it—this extra rad Dodge Viper. 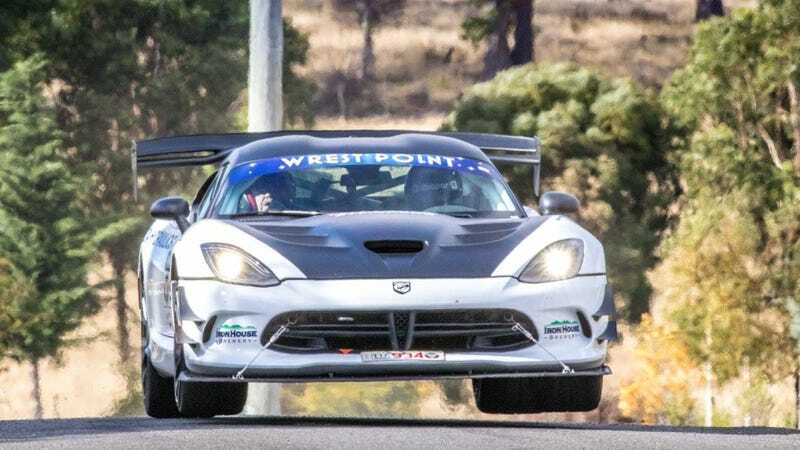 Seven-time Targa Tasmania winner Jason White decided to build this 2016 Dodge Viper ACR Extreme into a rally car when new eligibility rules deemed it worthy. The car—which was only lightly modified from stock to fit in the Targa Tasmania regulations—reaches a top speed of over 163 mph during the run, and it sounds incredible. White’s fast driving and solid guidance from his uncle and navigator John White have now earned two Targa Tasmania wins with the Viper, in 2017 and 2018. He makes driving this tail-happy behemoth look far easier and smoother than I know it is in the onboard view. Pump that V10 exhaust note directly into my eardrums forever.